Content Aware Sidebars lets you add category sidebars, tag sidebars, or widget areas for custom taxonomy term archives. Not only is it possible to get specific page sidebars and post sidebars, but also to create sidebars for posts with select categories or tags! Show or hide widgets on content with any category, tag, or term with this feature. Content Aware Sidebars gives you complete control, and you never have to hassle with slow widget visibility options again. Simply use the widget area manager to add a new sidebar. Select the categories you want to display it on. The plugin will take care of the rest automatically. If you just want to display your new widget area on category archive pages, and not on single posts, there is an option for that as well. You do not have to enter the category conditions twice, just toggle “Singulars” or “Archives” to ON or OFF. Content Aware Sidebars supports all custom post types and taxonomies, which makes this feature extremely powerful. 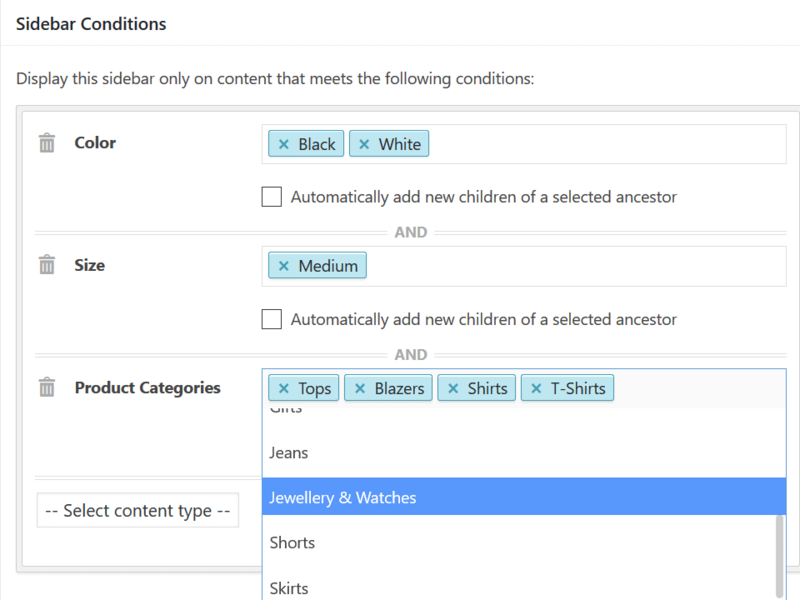 You can for example create sidebars for WooCommerce products with select attributes or product categories. This is the perfect solution when you use plugins that create custom taxonomies and want to make your widget areas stand out. Instead of always displaying the same widgets for all categories or terms, you can now display more relevant widgets. If you’re running a WooCommerce webshop, display widgets that improve conversions and increase your sales! If you use another plugin for your webshop, you create sidebars for Easy Digital Downloads as well. Content Aware Sidebars is the fastest widget area plugin for WordPress, and you never have to write any confusing widget logic code to add taxonomy and category sidebars.